I know everyone is busy this time of year, with the beginning of school, easing into routines and new activities. The Bit goes to preschool year round, but today is my birthday, next Thursday is her birthday, between mid-August and mid-September there are about six birthdays between family, friends and kids at school, not to mention a holiday weekend and husband going out of town for a week. So I’m not really looking to add anything on right now. But I see my birthday as a kind of new year, so I also spend a lot of time this time of year thinking about how I want to improve my life — you know, like New Year’s resolutions — and one thing I’ve been thinking about is how to help others more. I don’t feel like I have time for volunteering, though I probably do if I were willing to make time for it. But I can still help, in ways big and small, to brighten people’s lives. This is what I love about Champions for Kids, a local to Northwest Arkansas group with tremendous reach. 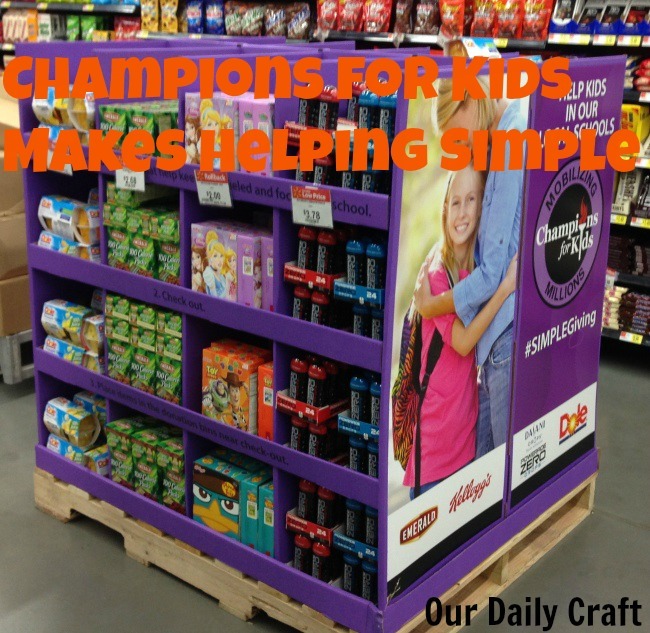 They have lots of great ideas for busy people to help in their communities, and the support of Walmart helps them mobilize a bunch of people to help in their local communities. A recent drive to collect toothbrushes in 24 stores resulted in more than 20,000 brushes being donated to kids in need. The current project, taking place in Arkansas and Southern Missouri, has people collecting snacks that will be donated within the school district where the Walmart is located. This is such an important thing because kids who live in homes where food is scarce rely on healthy snacks from school when they might not have an evening meal to come home to. 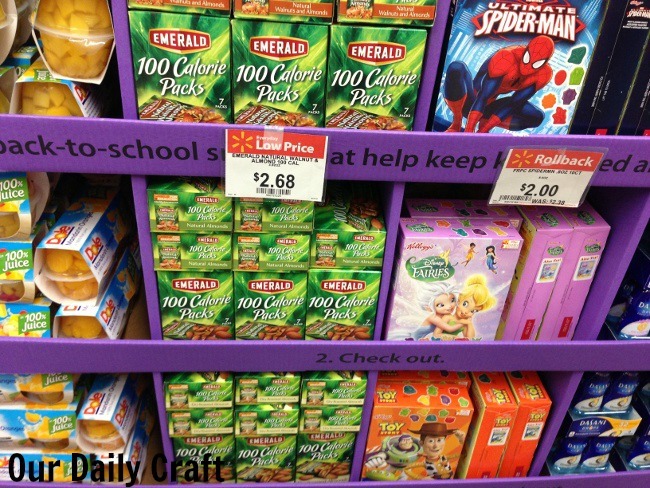 I was excited about this project when I first heard about it, but was even more excited when I walked into Walmart and found the donation display because I saw a lot of things I rely on as snacks in my own home. 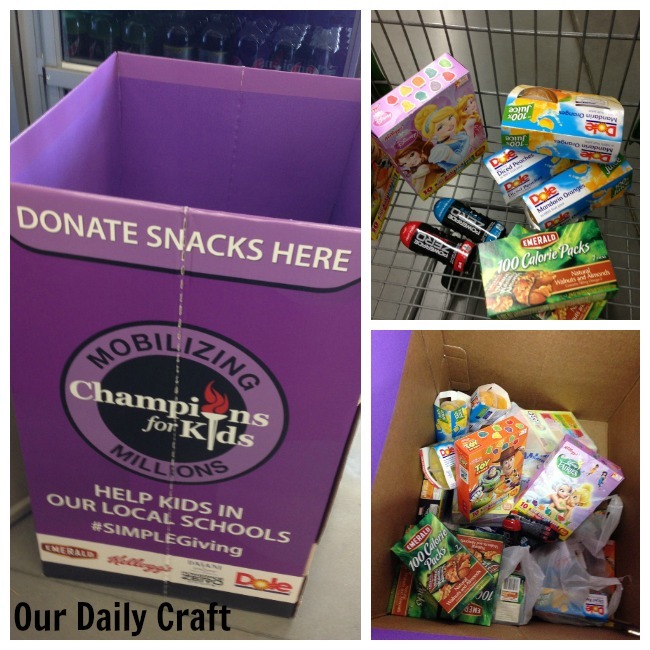 I was doubly glad to help when I saw they were donating products I might have chosen to give, or to buy for my snack-crazed preschooler (she gets it from me). 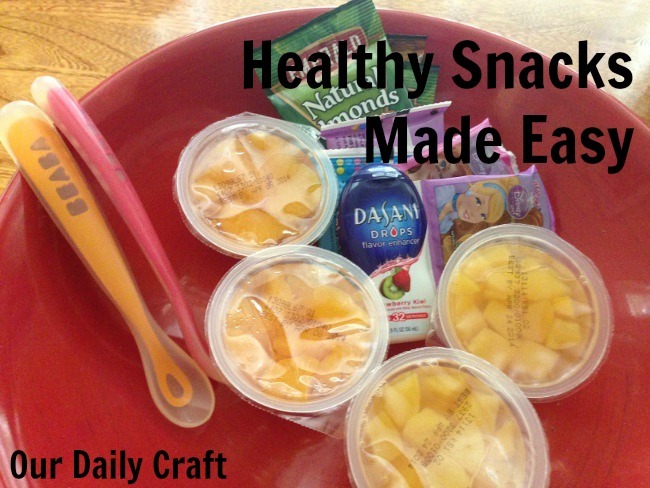 Dole Fruit Bowls/Squishems: We use fruit bowls all the time because they’re so darn convenient. Even when fresh fruit is available we still go through a lot of these. They’re such a healthy snack for kids. The bit calls Squishems “squishy fruit,” but she also says only babies eat them, so we stick with the fruit bowls these days. Kellogg’s gummy fruit bites: The Bit is a huge fan of fruit bites, and I think she’ll love these, too. They’re extra fun because they are available in the shapes of Disney characters. They’re made with real fruit, just 70 calories and are fat free, which is perfect for when she declares she’s hungry an hour before dinner. Some of them are gluten free, too, which is great. Powerade ZERO: I’ll admit to not knowing about this product, given I’m not an athlete, but these little drops pack a punch. They have sodium, potassium, calcium and magnesium, which are all lost when sweating, and they’re zero calorie. A little bottle is good for flavoring 24 servings of water, too, so it’s a great value as opposed to buying sports drinks. Dasani Drops: These naturally flavored, calorie-free drops are a great way to flavor water if you don’t like the taste of it plain. The six flavors can be used in any concentration you like but should be enough to make 32 servings, making them a great value, too. What’s especially nice about this program is you can choose what you want to donate, check out and donate the items right there in the store. You don’t have to drive somewhere else to drop them off or even carry them to your car. It’s perfect. While I was picking up goodies to donate, I grabbed a few extra things to make a snack station for the house. I just took a big bowl, filled it with a few of each choice, and a couple of plastic spoons so the Bit (or, let’s face it, I) could grab something healthy the next time hunger calls. And when it does I’ll be reminded that not every kid in our area has the luxury of eating whenever they feel a little hungry, and hope that our simple gift of snacks can help make a difference. Check out the stories of other bloggers who are doing some #SIMPLEGiving in their communities! I love the snack station!